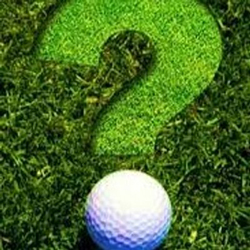 Welcome to the EFTGolf.com Blog! Here, Steve's shares his EFT related golf wisdom. Enjoy! Stinkin' Thinkin' Produces More Bad Golf Shots Than Positive Thinking Ever Helps! In his book, Golf is not a Game of Perfect, Dr. Bob Rotella states that “The correlation between thinking well and making a good shot is not 100% BUT the correlation between thinking badly and unsuccessful shots is much higher.” Simply put. Positive thinking and visualization does not necessarily create a good shot but thinking badly almost guarantees producing a bad shot. Unfortunately this truism plays out numerous times times in the course of a round. There are far more opportunities to expect the worst rather than the best. For Example: I’ll use a real life example of this. The sixteenth hole on the golf course that I play which is a 170 yard par three. It’s uphill with sand bunkers left and right as well as out of bounds on the right and over the green. There is even a little pond 90 yards short of the green which really never comes into play unless the shot is mis-hit badly. It’s simply there as yet another reminder of what could go wrong. 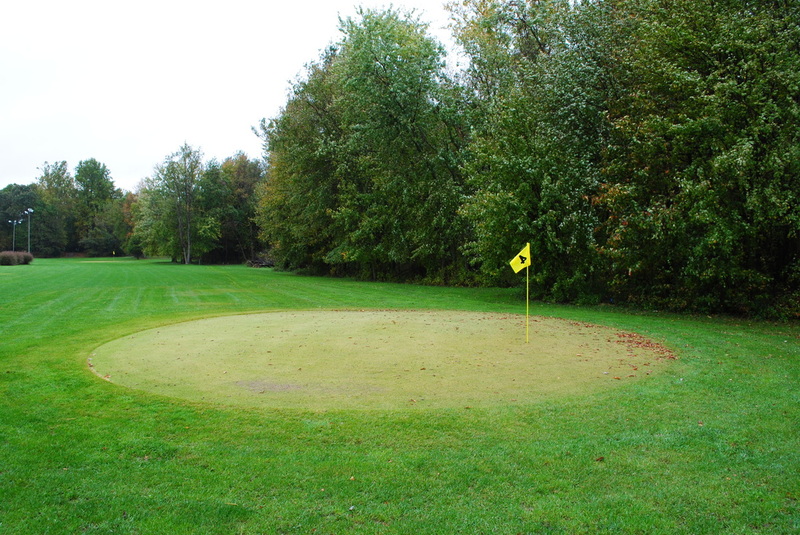 Most golfers gazing out at this hole are not thinking about the beautiful high fade shot they are going to hit that will travel the perfect distance land gently on the green in between the two traps and leave a putt for possible birdie. As we have learned, even if they are it does not guarantee a quality shot. More likely they are thinking some thoughts like the real ones I actually have had which I’ll share below. “What if I pull it left into the bunker, it’s such a hard chip shot with the green sloping away, I’ll never save a par.” “What if I push it right. There is not much room between the green and out of bounds plus it might hit the cart path on the right side of the green and bounce out.” “What if choose the wrong club and go long. It could go out of bounds or leave an impossibly difficult chip shot to an elevated green.” “What if heaven forbid, I flub the shot and knock it in the pond. Not only is it a penalty but it is embarrassing.” More Things Wrong Than Right There are four things that can go wrong and one can go right. Simple math says the odds are four to one that one of he negative thoughts will dominate. Since that is our thinking tendency anyway the odds increase even more. A major benefit of EFT is that it is not based on positive thinking which we have already seen does not predict a good shot anyway. EFT actually encourages you to bring the negative fear or emotion to the forefront of your mind so it can be addressed using the tapping procedure to eliminate the negative charge creating static in your energy system when these thoughts pop into your head. By eliminating this static and fear that accompanies it we will be able to take a smoother, stress free swing with a nice follow through rather than a frantic, hurried, choppy swing. The tension free swing has a much better chance of success compared to the scared, choppy swing. Sample Tapping Phrases to Use in the Tapping Protocol I’m afraid of pulling the ball left. I’m afraid of pushing it right. I hate this hole. Why does this hole have to ruin a good round. I’ve been out of bounds the last three times I played this hole. I haven’t made par on this hole the last three times I played it. I dread this hole. Need an update on the tapping points - view below. Want to learn more - visit www.eftgolf.com. You are receiving this email because you opted in at EFTGolf.com. Copyright (C) 2019 EFTGolf.com All rights reserved. 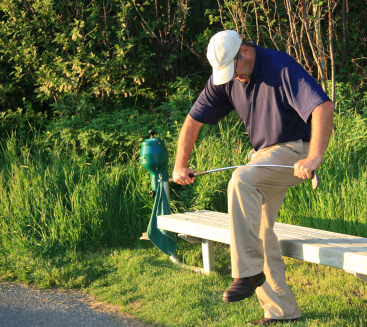 "How to avoid a Melt Down….ala Phil Mickelson"
world class golfer to do it. Well it left the announcers speechless. his stature ability and experience to lose control like that on a world stage. before and after his episode. his blowup when he knew he was getting frustrated. your next round of golf. Need an update on the tapping points - view below. Want to learn more - visit www.eftgolf.com. You are receiving this email because you opted in at EFTGolf.com. Copyright (C) 2018 EFTGolf.com All rights reserved. The number one question I get from clients is, “what do I start tapping on to improve my golf game”. They ask, is there a script, or magic words, how do I know what the most important problem is to work on? All good questions. First answer - there are no magic words or scripts. The success of EFT is based on eliminating negative emotions and beliefs that stand in the way of your success. We all have different experiences, viewpoints and beliefs that form the lens we look through today. Unlike socks there is no one size fits all, script or answer. So I say, start where you are. Very clever you say, but what does that mean. It means there are many doors you can open to arrive at the correct answer. So start where you are. A beginning golfer or recreational golfer has different goals than a seasoned player who competes at his club or a touring professional who competes for a living. So I repeat start where you are. Ask yourself what you want improve upon or change. Do you just want to make contact with the ball and stop whiffing? Do you want to be more competitive, have more fun, stop having anxiety when you play with friends. Perhaps you want less anxiety about joining a local golf league or playing with strangers on vacation when you are paired up with other vacationers. Start with the low hanging fruit and go for the easy problems. Start tapping as you focus on the immediate fear or problem. For example: I’m scared to death I’m going to miss the ball when I swing. I’m intimidated playing with friends who are better than me. I’m intimidated playing with strangers. I never seem to make a putt when the pressure is on. There could be countless more starting points because we are all unique though we may have similar fears. The success of EFT comes from delving deeper into the fears and emotions to find out where they started. By identifying and tapping on originating events when we first experienced an emotion we are then able to reduce and eliminate our negative response to it now. Sound simple. It is simple but requires some practice and of course learning the process. Order your copy of Better Golf with EFT today and get started on your journey to playing better golf today. You are receiving this email because you opted in at EFTGolf.com. Copyright (C) 2018 EFTGolf.com All rights reserved. Did you happen to see Megyn Kelly Today last week? With special guest Adrienne Cerulo, Megyn and Adrienne discuss how EFT freed her from excruciating pain. It's a clip worth watching - and a technique worth trying. Check out the clip here. Want to learn more about EFT? Visit www.stevebotuchis.com to learn more. Did you know you can improve sports performance as well using EFT? Improve your mental golf game by visiting www.eftgolf.com to learn more. View more posts from our blog here.